St. Peter's offers a wide variety of church ministry programs, as well as providing a "home" for many community outreach programs. Please contact the church office at 410-665-7300 to find out how you can join or volunteer. Sundays during the Education Hour (10 to 11 am.) in the confernce center. Thursdays, September through mid-June, at 10 am. in the lower level. Both of our worship service singing groups are excited to sing praises each Sunday! The Choir helps to lead our traditional service, while the Praise Team inspires those worshipping at the contemporary service. Choir members meet for rehearsal in the lower level at 7 pm. on Tuesday evenings (September to June). Praise Team members meet for rehearsal in the chapel at 10 am. on Saturday mornings. Since 1977 our School has been providing an academically rigorous, faith-based program of study for children in PreK through 5th grade. Our children make footprints worth following! To learn more about the Elementary School, please click on the "St. Peter's School" tab. Our pantryhas been operating since the 1990's! We are humbled to serve those less fortunate in our community. We operate on the 2nd & 4th Saturdays of each month from 9:30 am.-11:30 am. and, on average, serve 25+ families. The Food Center is located in the basement of the brick house just off of the Lincoln Avenue parking lot. For more information about our pantry, click on the "Ministries" tab. All women of St. Peter's are considered members of the WELCA, a community of women created in the image of God, called to discipleship in Jesus Christ, and empowered by the Holy Spirit. They commit themselves to grow in faith, affirm their gifts, support one another in their callings, engage in ministry and action, and promote healing and wholeness in the church, society, and the world. Their mission is to mobilize women to act boldly on their faith in Jesus Christ. Board meetings are held on the 1st Sunday of each month at 11 am. in the conference center, and Bible studies are on the 2nd Tuesday of ach month from 10:30 am. to 12 pm. in the conference center and on the 3rd Thursday of each month at 7 pm. at the home of the study leader (September to June). The WELCA participate in various minitries and projects throughout the year. 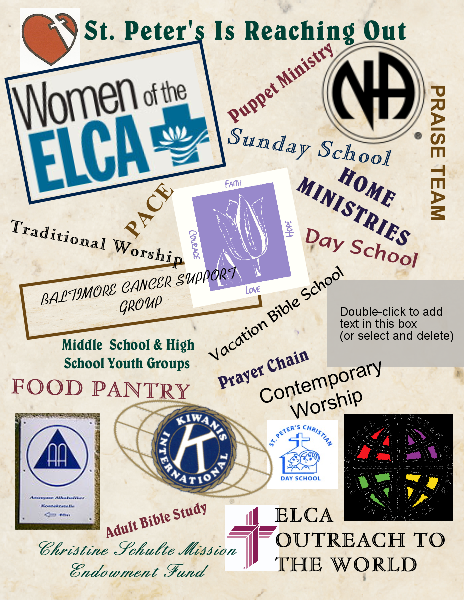 For more information about what we do and how you can get involved, see our page under the "Ministries" tab. This group is made up of the women of St. Peter's, but there is room for anyone if you can cut, pin, sew, knit or crochet! The quilters meet in the brick house just off of the Lincoln Avenue parking lot on the 2nd & 4th Mondays of each month from 9:30 am.-2 pm. Quilts made by this group are sent to area nursing homes and hospitals, and around the globe through Lutheran World Relief. VBS is a week long celebration of God's love shared through Bible stories, games, crafts, and music. VBS is for children aged 4 (and potty trained) through 5th grade, and is typically held the last week of July or the first week of August each summer. Alcoholics Anonymous - Group meetings are held on Thursdays at 7:30 pm. in the auditorium. Baltimore Cancer Support Group - Group meetings are held on Thursdays at 7 pm. in the conference center. For more information, contact the support line at 410-668-1762. Girl Scout Troop #1935 - Group meetings are held on Wednesdays (September to June) from 6:30-7:30 pm. in the auditorium (see "Calendar" tab for dates). Narcotics Anonymous - Group meetings are held on Fridays at 7:30 pm. in the auditorium. For more information, visit their website at www.na.org. Safe Harbor Christian Counseling - Counseling servces are held on the 1st level of the brick house located off of the Lincoln Ave./Belair Rd. parking lot. Please contact them at 410-529-5150 or visit them at www.safeharbor1.com. The Gideons International - Dinner meetings are held on the 3rd Tuesday of each month at 6:30 pm. in the auditorium. Traditional Yoga - This group meets on Saturday mornings at 8 am. in the fellowship hall. There is no admission fee, but donations are gladly accepted. For more information, contact Janet Earling-Bencivenni at 443-460-8842. Yoga for Arthritis & Chronic Pain - This group meets on Tuesdays at 5:15 pm. in the church lower level. Admission is $10/class. For more information, contact Kathy Campbell at 443-831-3414.